Chop four slices of cooked bacon. Set the remaining cooked bacon aside for serving. Add the beef, bacon, Worcestershire sauce, soy sauce and pepper to a bowl. Gently mix to combine making sure not to over-mix the meat. Divide the meat into 12 loosely packed meatballs. Place the meatballs on a baking sheet and bake for 12-20 minutes. Meanwhile, add the peanut butter to a microwave-safe bowl and melt the peanut butter for 30 seconds. Stir in 1-2 teaspoons of sriracha if desired. To assemble the subs, butter the warm rolls and place a piece of bacon on the bottom of each roll. Divide the meat balls between the rolls. If desired, add some cheese and place the sub back in the oven for 3-5 minutes or until the cheese is melted. Drizzle each sub generously with the warm peanut sauce. If you're tired of the same ol' sub, have we got a treat for you! 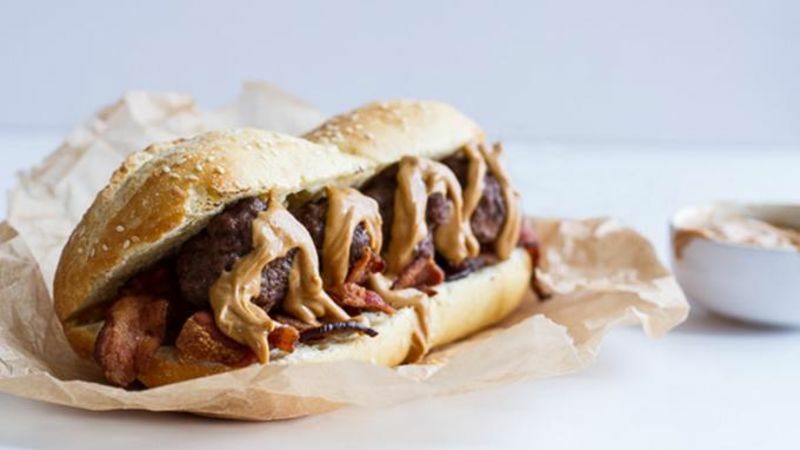 This one is loaded with meatballs, crispy bacon and spicy peanut sauce, and it'll change the way you think of subs forever. Today is the day you learn about the combo of peanut butter, beef and bacon – a combo that I personally have been eating since I was a kid. But every time I ask someone if they have heard of this combo, they look at me like I am crazy! While I do promise you that I am a little crazy, I also promise you that this combo and these subs are nothing short of amazing. I grew up in Rocky River, Ohio. There is not a whole lot to say about this town other than that summers on the lake are pretty awesome, winters can be pretty brutal, and the people are super friendly. Nonetheless, Rocky River is home to Bearden’s Restaurant. Bearden’s is the home of the peanut butter burger. Peanut butter slathered on a greasy diner burger, served with Slim Jim fries and a chocolate shake. So good. So good that I actually recreated the recipe last year. These subs are the meatball version with a little more bacon because, hey – why not? You only need some super simple ingredients for the subs. Basically beef, bacon, peanut butter and sub rolls. Pretty simple, but so good. Mix together four slices chopped bacon, soy sauce, Worcestershire sauce and pepper with the beef. Form the meat into 12-14 smallish meatballs and bake for 15-20 minutes. While the meatballs bake, warm up the peanut butter and, if desired, mix with some sriracha. Butter your rolls and divide the meatballs among each roll. If you're adding cheese, now's the time to do it. Believe it or not, even though I am a huge cheese lover, I prefer these subs sans cheese. I really love the peanut butter flavor to shine through! Drizzle on a heavy helping of warmed spicy peanut butter. Now discover the joy that comes from bacon, meatballs and peanut butter on bread. So delicious! To find more of Tieghan's recipes, visit her blog Half Baked Harvest, and check out her Tablespoon profile, too!